Backgammon is a two-player game that is played on a board consisting of twenty-four points also known as triangles. The points alternate in color and are set up in quadrants of six points each. There are four sections of the board. The quadrants are further broken down to the player's outer board and their home board. These quadrants are separated by what is called the bar. The points on the board are numbered from 1 to 24, starting in the player's home board. Each player has fifteen stones. The initial arrangement of stones is shown on the board to the right. Both players have their own set of dice and the dice cup. A doubling cube is numbered 2,4,8,16,32, and 64 on the face and is used to keep track of the current stakes of the game. The objective of the game is to move all your stones/checkers into your home board and remove them (bear off) before the other player does. The first player to remove all their stones/checkers wins the game. To start the game, each player rolls a single die. The player throwing the higher die wins the opening move. In the event of a tie they roll again until the tie is broken. The player who rolled the higher number now moves his stones according to the numbers showing on both dice. When that is complete the opponent then rolls two dice and alternate turns begin. Your turn is considered over when you remove your dice from the board. The roll of the dice indicates how many points/triangles the player is to move his stones/checkers. The stones are always moved forward to a lower-numbered point. The objective being to get all stones in your home court for removal. A stone may be moved only to an open point. That is a point that is not occupied by two or more blocking stones of the opposing player. Your two dice constitute two separate moves. As an example, if you rolled a 4 and a 2, you could move one stone four points to an open point and a different stone two points to an open point, or you may move one stone the total of six points to an open point but you may only do this if either the two or four intermediate points is open. If doubles are rolled you may move double what is shown on the dice. A 5 and 5 roll would mean the player has a total of 20 points he can move in 5 point increments. He may move any combination of stones he feels best serve his play. Both dice must be played, if possible. When only one die can be played, the player must play that number. If either one can be played but not both then the player must play the larger one. This is called a forced move. When neither number can be played the player then loses his turn and the opponent will roll. Any point that is occupied by a single stone is open and subject to a hit. This is called leaving a blot. If the opposing stone lands on that blot the blot is now hit and placed up on the bar. Once you have been hit and put on the bar you must enter back into the opposing home board. The stone is entered when you roll your die and can enter on an open point in your opponent's home board. As an example, if you are on the bar and you roll a 3 and 5 and those points are open in your opponent's home court you may enter on either one. If his points are blocked then you remain on the bar until you do roll back in. A point is considered blocked if your opponent has two or more stones on that point. If he has the points blocked you lose your turn and the roll reverts to your opponent. You must re-enter any stones that have been hit before you can make any other moves on the board. If you have been hit two times and are on the bar with two stones you must re-enter both prior to any other moves. After the last stone has been entered any unused numbers on the dice must be played. You may then move either the stone you entered additional moves or any other stone you own on the board. Each game of backgammon begins with a value of one point. During the game if a player feels he has the advantage, he may double the stakes of the game using the cube. It must be your turn and you must do this prior to rolling your dice. Once a player has offered the doubling cube it may be refused. At this point the opponent concedes the game and resigns one point. If he accepts the cube the game continues at the value on the cube. Once you have accepted the cube you now become the owner of the cube and only you have the opportunity to re-cube if you so desire. If you as the owner see it is to your advantage you may redouble. If your opponent refuses a redouble, they resign the points on the cube as it stands. If they accept the cube they then become the new owner of the cube and the game continues at twice the previous stakes. The cube may be doubled to 64 points. The increments on the cube are 2,4,8,16,32, and 64 points. Once you have moved all fifteen stones into your home court you may begin bearing off. Bearing off is the removal of the stones. A player bears off a stone by rolling a number that matches the point on which the stone reside. He may then remove that stone from the board. As an example, if he rolls a 4 it allows him to remove a stone on his four point and take if completely off the board. If he has no stones on that point he must move a stone on a higher numbered point to a lower point for future bear off. A player is not required to bear off if he can make any other move. If at any point you have a stone hit during your bear off, you must then re-enter back into your opponent's home court and can not remove any other stones until you return to your own home court. The first player to remove all fifteen stones wins the game. If the losing player has removed at least one stone, he loses only the value showing on the doubling cube. If the cube has not been offered there is no double and the value is one. If the loser has not removed any stones he is then GAMMONED and loses twice the value of the present game. If the loser has not only not removed any stones but still has a stone either on the bar or in the winner's home court he is then BACKGAMMONED and loses three times the value of the cube. Is there any limit to how many stones I can have on a single point? There is no limit. The term "Candlesticks" means to stack all your stones on a few points that are already established. This is sometimes necessary, but is generally not desirable. Is there a limit to how many stones can be on the bar? Not according to the experts. A double closeout position is impossible and that would be the only way for this to happen. I just came off the bar. Can I move my other die value? Yes, if you have no other stones on the bar you must use the remaining die. You can make no additional moves until you have cleared the bar. Can I double if I have a stone on the bar? Yes, you can double prior to your roll. This includes time when you don't get to roll because you have a stone on the bar and your opponent's board is closed. Can I cube on the first turn of a game? Yes, doubling at your first opportunity when you are trailing after the Crawford game makes sense and is good strategy. If you lose this game you will lose the match anyway. Doubling guarantees that you get at least two points if you win. Can I pass when it's my turn? No, you must roll and play if possible. Can I play one number to avoid playing the other? No, you must play both dice whenever possible and, if only die can be played, you must play the larger one. This is called a Forced Move. When is my turn over? Your turn is over when you pick up the dice. On the internet that translates to clicking the "done" button and the dice reverting to your opponents side of the board. Is my game more valuable in ratings if I cube to 64 points? Your rating for your account is based on the difference between your rating and your opponent's and the length of your match. If you have set a match for 5 points it makes no difference if you win the match 10-1 or 5-1. When the final move is made the match is worth 5 points. Nothing over the set match length has any value in the rated games. To continue play after a double is "thrown" - known as a "Take". The one point on a player's board. A stone that is open to make a point. Holding the 4 or 5 poins on the opponents home board. When a player has a lower pip-count than their opponent. Any point held by two or more of a player's stones on his opponent's home board. A very bad roll. One that could impact the outcome of the game. When a player tries to stop his opponent by keeping at least two anchors in his opponent's home board hoping to slow the opponent in bearing off and to make a hit. You try to use these points to hit your opponent and send him back. Back games are most effective when you also have a prime to trap any of the opponent's stones you are able to hit. This strategy is generally used when a player is behind in the pip count. A game valued at three times the value of the cube is awarded when the losing player has not removed any of his stones from the board and has one or more stones in the winner's home board. A divider in the center of the board that separates the inner and outer boards. The place where a hit stone is placed until they reenter into the game play. This is not counted as a space. The 7 and 18 points. These are the points closest to the bar on the outer board. The final stage of the game when you remove your stones from your home board. A rule used in money play that says a player who accepts a double may immediately redouble without giving up possessions of the cube. The player who originally doubled may refuse the beaver, in which case he resigns the game and loses the current doubled stakes. If he doesn't he must accept the beaver and continue playing at quadruple the stakes prior to the cube. When a player has a higher pip-count than his opponent. A point occupied by two or more stones in front of your opponent. An exposed or single stone on a point. A huge error either with a stone play or a cube error. Backgammon is played on a board with twenty-four points. The triangles or points alternate in color and are set up in four quadrants of six points each. The quadrants are referred to as the player's home and outer boards. A computer program on a server that plays as if it were a human player. When both players have moved past the last of their opponent's stones and there is no longer any possibility of a hit. To open one or more points in a prime. A spare stone set up with the intention of making that a point. A point that has stacked stones, also known as towers. The state of the cube before either player offers to double. A playing piece. A stone/man/checker. A form of backgammon for three or more players. One player, the Box, plays on a single board against all the others who form a team led by a captain. To make all six points in your inner board while your opponent is on the bar. This eliminates them from being able to roll in. A point containing two or more of your opponent's checkers. A position in which it's possible for one player to still hit or block the opponent. Until someone cubes, no one controls the cube. It is considered centered. Once a double has been offered and accepted the accepting player then controls the cube and is the only one that can offer a redouble. To place a second stone on an exposed blot, thus protecting and making a point. In match play, when one player is within one point of winning a match, no doubling is allowed for one game. The movement of a stone from one quadrant of the board to the adjacent quadrant. The forced break down of your board due to lack of alternate plays. When you cube you are offering a double to your opponent. They have the option to accept or refuse the double. This indicates which player has the right to double on their turn. Whoever accepts the double then retains the cube and has the right to re-cube at a later time. If a cube has not been offered it is a centered cube and is owned by neither party. To roll any combination of dice that cannot be played. Usually refers to the one or two point on the board. A shot that is six or fewer points from your opponent's blot. To spread your men out so as to increase your chances of a more favorable roll. cube and increase the point value of the game. It may be accepted (taken) or rejected (dropped). If it is accepted the points increase to the value on the cube, if it is rejected the game is resigned for the current value of the cube. To hit two opposing blots in the course of making one move. A match in which both players need one more point to win. To refuse a double offer or to drop a man on a point (to slot a man). The open point directly in front of a prime. To move a stone from the bar to a point in your opponent's home board according to your roll. This is the only move a player has at that time. The value of your position to one of the players. It is the sum of the values of all the possible outcomes from any given position multipled by their probability of occurring. To advance a stone to safety or past the opponent's blockade. An open blot that can be hit and delegated to the bar. An indirect shot which is only possible with a few combinations of the dice. A roll of the dice for which there is only one move allowed. A prime of six consecutive points. This completely blocks the opponent's ability to escape stones from behind the prime. When the winner of a game bears all his stones off the board before his opponent bears off any, he wins a gammon, or two times the value of the cube. The opponent's 5 point, which is your 20 point. A game where you hold a point or points in your opponent's inner board or outer board in order to prevent him from safely coming into his home board. The inner board where you bear off your stones. Each player's home board has points one through six. A shot that is more than six points away and would require more than one die to hit. The two quadrant of the board with the six lowest numbered points for each player - the two home boards. This rule is used primarily in money games. Players can agree before the game begins that gammons and backgammons will only count as 1 point if the cube has not been turned. This is an exceptionally good roll, one that has the potential to change the outcome of the game. An important strategic point on the board. For example, the five, four, and bar points for each player. A spectator who watches the game. To move a stone deep within your own home board. This is called a dead stone because it will be of limited further use in the game. To leave a stone exposed within range of your opponent. Moving a stone from the 24 to 13 with a 6-5 opening roll. To block a point with two stones, thereby stopping your opponent from occupying that point. A contest in which the first player to reach the agreed upon number of points is declared the winner. The number is determined prior to play. A match score in which the leading player needs one more point to win the match. A player's probability of winning the match based on the current score and the position in the game. A game in which no further contact is possible. When it is your turn you are said to be "on roll". The two quadrants of the board that are not home boards. To be the last player of the current game to have accepted the doubling cube. Only the owner of the cube can double. To drop or refuse to accept the cube when doubled. At this point you have resigned the game. One dot on the dice or the unit of distance on the board from one point to another. The total number of pips or points that are needed to bear off all fifteen stones from your current position. One of the twenty-four triangles on the game board and a unit of the score in match play. Consecutive points held by a player forming a block against his opponent's stones that are behind the prime. A game in which both players have extensive primes with the opponent's stones trapped behind them. The winner of this game is usually the player with the better timing. The same prearranged position to be played over many times as a means of settling any dispute over which play would be best. 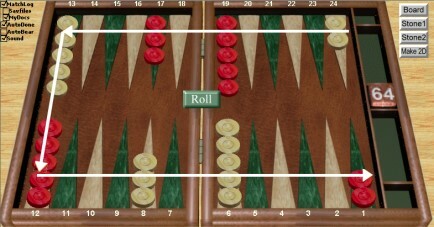 One of the four sections of the backgammon board. Each quadrant contains six points. An immediate redouble by a player who just accepted a beaver. To allow a blot to be hit in order to get the stone on the bar. This may be done to attempt to hit your opponent's stones or to gain time in the game. Any double other than the first cube in the game. To come back in from the bar. To accept defeat and end the game. Resignation is a form of settlement, you must specify if you are resigning a single game, gammon or backgammon and your opponent must agree. Resigning is not permitted in tournament play before contact is broken. A shot your opponent will have to hit you after you have hit them. To make a new point at the edge of the prime, using your stones from the back. The two men that begin on your opponent's one point. A game in which the objective is to move around the board as rapidly as possible taking you into a race. A play where you are safe and cannot be hit. To avoid losing a gammon. An opportunity to hit your opponent's blot. Any game in which neither a gammon nor a backgammon takes place. To leave a single stone exposed on any point with the intention of covering the blot on a future turn. To separate two men which are together on a point and leave behind a blot. Leaving your opponent in a position in which the only moves he can make can hurt him. Four or more stones stacked on any one point. A playing piece. A man or checker. A point lacking extra builders. A home board that has several points covered. To accept the cube and continue to play. The rate of advancement during the game.